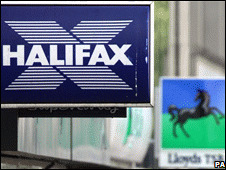 Shareholders at Halifax Bank of Scotland (HBOS) have overwhelmingly agreed a takeover deal with Lloyds TSB. Lloyds shareholders had backed the deal in November, and HBOS shareholders had been widely expected to follow suit. Meanwhile, HBOS shares fell almost 23% as the bank said it was operating in "increasingly difficult market conditions" and bad debts were rising. Lloyds fell almost 18% and Royal Bank of Scotland lost 15% on fears the sector shared HBOS's problems. HBOS said that bad debts and losses on assets had risen to £8bn ($11.9bn) in the first 11 months this year, up from £4.8bn at the end of September. Bad debts on corporate loans jumped to £3.3bn from £1.7bn. "Global market and economic conditions, UK recession and increasing unemployment will continue to present a particularly challenging operating and credit environment," HBOS said. "However, through the injection of capital and liquidity facilitated by the UK government, both currently and going forward, HBOS remains confident in its ability to navigate through this difficult period, as it becomes part of the enlarged Lloyds Banking Group," it added. Analysts said that HBOS's trading update showed how fast the economy was deteriorating. "On retail things are going to get worse, but people were expecting that," said Mamoun Tazi, analyst at MF Global. "On the corporate side people knew it was going to get bad, but it's worse in terms of magnitude and speed of deterioration," he added. The UK Government gave the green light to the takeover on 31 October. It overruled competition concerns raised by the Office of Fair Trading. Business Secretary Lord Mandelson said at the time that the public interest of "preserving the stability of the financial system" outweighed any potential anti-competitive effects. A legal challenge to the takeover was rejected on Wednesday. The Competition Appeal Tribunal was asked to decide whether the government had been right to bypass competition concerns in allowing HBOS to be rescued. Shareholders attending the meeting said they had little choice but to accept the deal. "I shall vote in favour [of the takeover] because the bank has got itself into such a state it's the only way to save the company," Gary Maddock, an HBOS shareholder, told the Reuters news agency. Scotland's first minister, Alex Salmond, said he would have preferred HBOS to remain independent - but he wished the group well for the future. "What's done is done, and the Scottish Government's job is to represent Scotland's interests in the new merged organisation in order to maximise jobs and decision-making in the Scottish economy, and minimise the difficulties over a lessening of competition," he said. "I welcome the recent announcements by Lloyds TSB in terms of retaining the Bank of Scotland brand, and the Scottish board chaired by Archie Kane to represent all the interests of the enlarged group in Scotland. "These have been positive statements, and we will be continuing a dialogue as the bank's plans become clearer, and we strive to secure the best possible outcome for Scotland in the circumstances." Scottish Liberal Democrat leader Tavish Scott said that he was "disappointed but not surprised" by the fact that the takeover deal had been approved. "This is bad news for jobs and competition in Scotland. Scottish customers and businesses will face higher bank charges in the future as a result," he said. When the deal is completed, it will lead to the creation of a banking giant with 145,000 staff and 3,000 branches. However, there are fears that thousands of jobs could be lost after the takeover goes through.